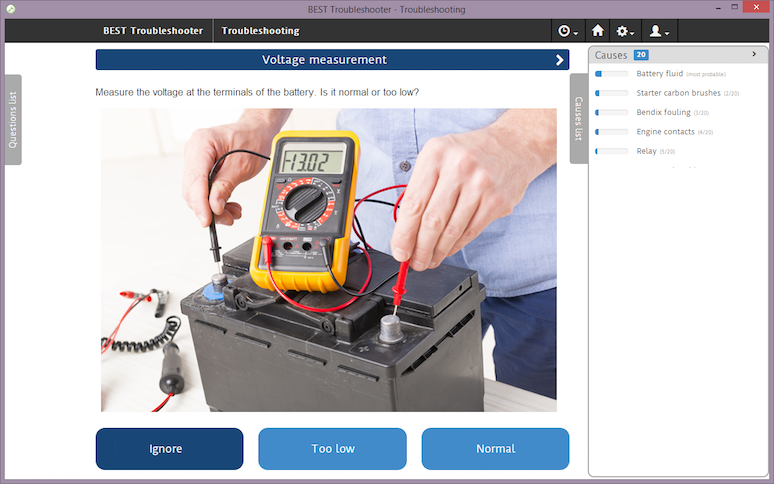 The BEST Troubleshooter interactively guides service representatives or technicians through troubleshooting sessions. When using models generated with BEST Author, the BEST Troubleshooter suggests diagnostic and corrective actions in such a way that the expected cost of each session is minimized. When using a prescriptive model built with BEST Decision Tree, the BEST Troubleshooter enforces the correct sequence of action. Processes all available information at the start of a troubleshooting session, including system configuration, error codes, test bench results. Provides step-by-step recommendations for diagnostic and corrective measures with the objective of providing a solution at the lowest cost. Automatically documents each action and its corresponding result, so BEST Author machine learn the in-service experience and improve the overall troubleshooting model. Amount of information to be displayed can be configured. The degree of operator flexibility, i.e. you can define up to what degree an operator's initiative is permitted. Availability of session history with selective undo/redo.